The primary form of federal funding for community health centers is the Health Center Program, which is authorized in Section 330 of the Public Health Services Act. More commonly known as the “330 Grant,” funding for the Health Center Program comes from a combination of discretionary funding, appropriated by Congress each year, and mandatory funding from the Community Health Center Fund (CHCF). 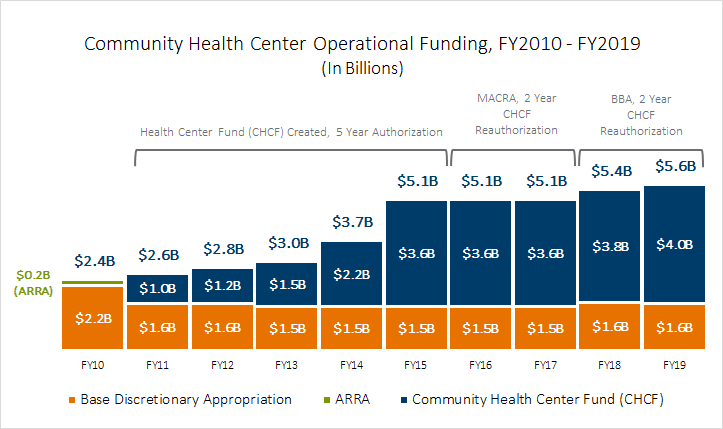 Since FY2013, annual discretionary funding provided by Congress for health centers has been level at roughly $1.5 Billion. In March 2018, Congress passed the Consolidated Appropriations Act of 2018, which boosted FY18 discretionary funding to $1.6 Billion. In September 2018, Congress extended that level of funding through Fiscal Year 2019. Learn more about the annual federal budget process. Every year health center champions circulate Dear Colleague letters in both the House and Senate that Members of Congress can sign to show their support for health centers in the appropriations process. The most recent round of Dear Colleague letters, including lists of signers, are below. To learn more about each of these bills, please see this Health Center Funding Chart.